Both Gocek and Marmaris are the highlights of the yacht charter gocek to marmaris destinations located in the Southwestern Turkey, Marmaris is well known with lively nightlife and endless shopping possibilities with very competitive prices, not to mention water front cafes, bars and restaurants always offering a good service accompanied with a splendid view. 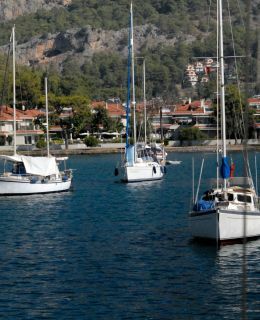 Gocek is a small but mighty town , hosting hundreds of megayachts , motor yachts and sailing boats with her ever sheltered, deep waters which makes Gocek unique in the mediterranean basin. Recently Gocek municipality has improved this little town so much that it is one of the meeting points for rich and famous as well as glamourous megayachts. We prepare our yacht charter in Gocek harbour, our experienced staff will help you settle in your cabins. as soon as possible. your very first swimming stop would be at Boynuz bay. 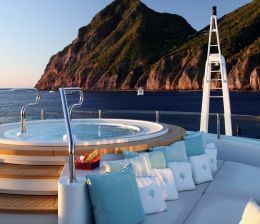 we wish you get the best spot because this place is the favorite of most of yacht charter captains. we propose to take you to sarsala bay to spend the first night , all you have to do is be grateful to god for such an opportunity and enjoy the ever dancing lights on the dark blue mediterranean waters and listen to happy cheers in the darkness of the night. let your captain take care of small details before heaving up the Anchor, relaxed at the bottom all night long…! do you mind if we take you to Dis Gobun bay where the water is so clear and attractive for snorkelling, together with those pine trees , so close to the sea, as if they are also trying to swim … you will be enchanted at Dis gobun bay where we take our lunch as well, your captain has to make sure you spend the overninght in a safe and sweet place to keep on relaxing so he steers the rudder to the Aga Limani where you will be served a 5 o´clock tea , aperitives before dinner and of course the highlighted meal of the day , the dinner. you might wanna take your camcorders with you and take a little walk to the little chapel at the end of the road and have a look at the natural beauty. where we serve you lunch , later on we shall take you to kumlu bay to spend an unforgettable evening . The breakfast will take place at Kumlu bay , donot miss the opportunity to swim and aground your feet at the Sandy beaches of Kumlu bay , jogging would be a good idea on the Beach to Speed up the blood circulation. Breakfast with Rich varieties of fresh food thence we take you to Cennet (paradise) island up untill 5 o´clock to enjoy the relax afternoon . then we take you to famous marmaris to spend the evening. 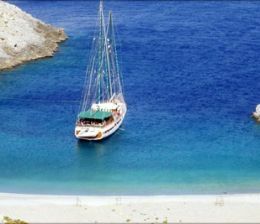 our yacht will have to replenish fresh water and the supplies while you are out for a colourfull and Entertaining night in marmaris . trust your captain , he will lead you to the right places to have some fun. right behind the small peninsula there is a small but splendid bay which is called lovers bay amongst locals . get your fins , masques , snorkels and hit the water for an underwater promenade… other swimming stop at Kuyruk point . the Beach is so special as if someone has built this place for private use. Dinner will be served here with Delicious mediterranean dishes while listening soft and contemporary music. swimming is the best activity in the morning before breakfast . toasted bread and Turkish sucuk makes you forget about the last diet that you have started for this summer. We are heading to domuz island , pancho bay , you may count the pebble Stones at 10 meters depth , so clean , so clear and so refreshing… we are going to binlik bay for an overnight stay. Walking on the island or, snorkelling is another option. Our Cook prepares some aperitives or turkish meze to company your cold Raki which is favorite mediterranean drink of all. The mediterranean is so attractive at 07H00 in the morning , so calm and cristal clear that you wont be able to resist to take your morning shower with sea water. after a week on board you may realise that swimming stops feels shorter in Binlik bay where Cleopatra used to swim there is a roman bath built for her, who knows why would she need a bath there however binlik bay makes you feel like a Celebrity.. The lunch is colourfull and tasty , Vira bismillah we heave up the anchor, the soft afternoon breeze takes us to yassicalar without hummering of the Engine just sailing in complete silence the crew is experienced and aware of that you are enjoying with utmost pleasure. aperitives are Ready we are sipping 5 o´clock tea is while we say goodbye to the sun… overnight in yassica island.